Perfect for corporate events, picnics and parties or for use as an outdoor prop table. Featuring an expanded metal table top and comfort slope edges that add to the visual appeal of this table. Outdoor tables are offered in several lengths to fit nearly any space, and come without seats to maximize space and utility. Table tops are available with a lightly textured Polyethylene finish, and the 2-3/8" O.D. steel frame is powder-coated in your choice of colors shown below. For permanent placement, add a surface or in-ground mounting kit from the optional accessories section. 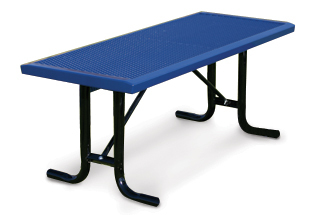 All wheelchair access rectangular outdoor tables conform to latest ADA specifications.